94 • ROCK products • November 2018 www.rockproducts.com www.qemarketpl ace.com ARIZONA CONSTRUCTION EQUIPMENT, INC. See our website www.azce.com for complete inventory descriptions and photos. (602) 257-0802 Bob Grant P.O. 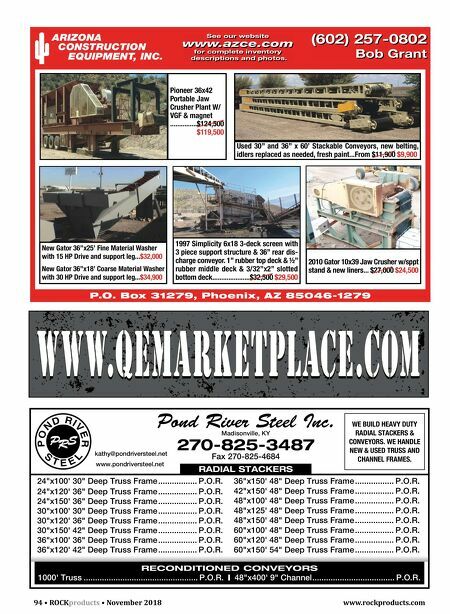 Box 31279, Phoenix, AZ 85046-1279 Used 30" and 36" x 60' Stackable Conveyors, new belting, idlers replaced as needed, fresh paint...From $11,900 $9,900 Pioneer 36x42 Portable Jaw Crusher Plant W/ VGF & magnet ...............$124,500 $119,500 1997 Simplicity 6x18 3-deck screen with 3 piece support structure & 36" rear dis- charge conveyor. 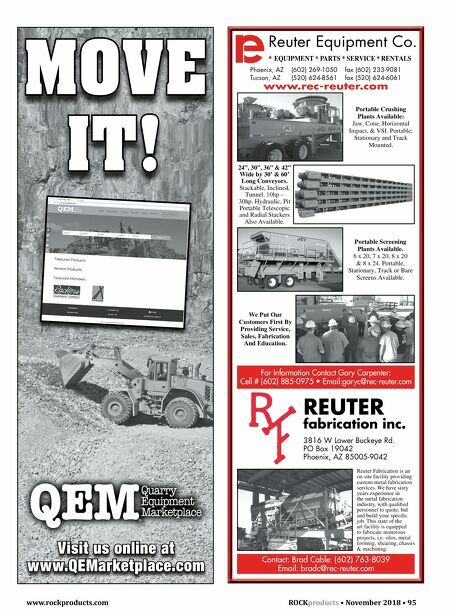 1" rubber top deck & ½" rubber middle deck & 3/32"x2" slotted bottom deck.....................$32,500 $29,500 2010 Gator 10x39 Jaw Crusher w/sppt stand & new liners... $27,000 $24,500 New Gator 36"x25' Fine Material Washer with 15 HP Drive and support leg... $32,000 New Gator 36"x18' Coarse Material Washer with 30 HP Drive and support leg... $34,900 RADIAL STACKERS 1000' Truss .................................................. P.O.R. 48"x400' 9" Channel .................................... P.O.R. RECONDITIONED CONVEYORS 24"x100' 30" Deep Truss Frame ................. P.O.R. 24"x120' 36" Deep Truss Frame ................. P.O.R. 24"x150' 36" Deep Truss Frame ................. P.O.R. 30"x100' 30" Deep Truss Frame ................. P.O.R. 30"x120' 36" Deep Truss Frame ................. P.O.R. 30"x150' 42" Deep Truss Frame ................. P.O.R. 36"x100' 36" Deep Truss Frame ................. P.O.R. 36"x120' 42" Deep Truss Frame ................. P.O.R. 36"x150' 48" Deep Truss Frame ................. P.O.R. 42"x150' 48" Deep Truss Frame ................. P.O.R. 48"x100' 48" Deep Truss Frame ................. P.O.R. 48"x125' 48" Deep Truss Frame ................. P.O.R. 48"x150' 48" Deep Truss Frame ................. P.O.R. 60"x100' 48" Deep Truss Frame ................. P.O.R. 60"x120' 48" Deep Truss Frame ................. P.O.R. 60"x150' 54" Deep Truss Frame ................. P.O.R. Pond River Steel Inc. Madisonville, KY 270-825-3487 Fax 270-825-4684 www.pondriversteel.net kathy@pondriversteel.net WE BUILD HEAVY DUTY RADIAL STACKERS & CONVEYORS. WE HANDLE NEW & USED TRUSS AND CHANNEL FRAMES.